I receive quite a few emails from this blog, and it is hard to find time to answer them all, but one of the most common requests I am asked is to provide a detailed French Braid instruction. Honestly, the French Braid is one of the most difficult braids to explain “step-by-step” and really must be shown in person for one to get the whole idea. So, given your requests and the fact that I couldn’t possibly show all of you how to do this in person… here is a video we filmed over the weekend with instructions on how to create a French Braid (and “K” in her soccer uniform). Click to watch video, or click here to view on YouTube. I hope this clip helps! 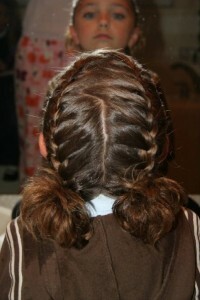 The “A, B, & C” stranding (with the B strand always in the middle, and that you add hair to strands A & C as you braid down) is the key to successful French Braiding. As mentioned in the video, it really takes practice. This French Braid style is a very cute hairstyle that holds well and makes for an equally cute Second-Day ‘Do with a few accessories!